Once upon a time there was a girl and her Blue Bear. They were of great comfort to each other. They cuddled. They had birthday parties for Bear. Weekly. Bear went to the store and the library and the park. Sometimes they sang. 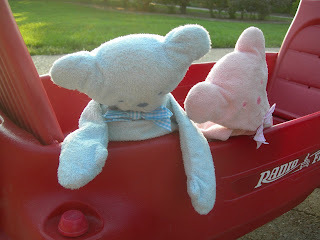 Bear was often dressed in jammies with little red hearts on them, or his pink comfy loungewear. Recently, he even acquired a fancy metal and wooden tricycle. Boo knew where her Bear was at all times. She wouldn’t sleep without him. Alas, all things come to an end. One rainy night this week, Blue Bear spent the lonely hours in the playhouse, alone, outside. In the morning, Boo put on her rain boots and rain jacket and rescued him. But what does it mean, when he is so totally forgotten until the next day? Will he forgive this? Can he ever forget? On the other hand, last night Bear started the night across the room in a little bed of blankets, but when I checked on Boo later, his whole sleeping ensemble had moved into her bed. She was probably worried about him, with his “broken leg” and all. Poor Bear.